Today, my daughter and I did a little shopping. We didn't buy much but we did try on some clothes. I wanted to try on clothes just to see what size I was...etc. Before I show you my *Now* pictures I thought I would show you my Then picture. 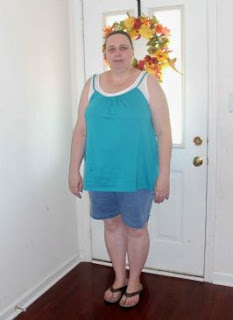 I was 270 pounds (not my heaviest weight either). 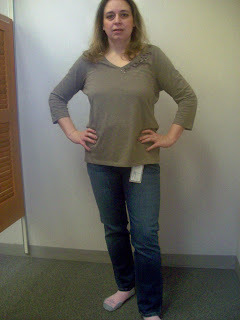 I wore a size 24 in Jeans. And a 4XL/5XL in shirts. I look just miserable...and I probably was! Today, while we were at Kohl's. 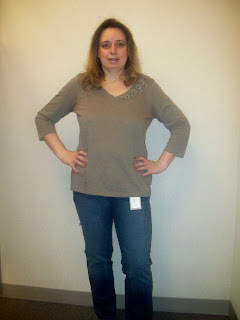 I thought I would just try a size 14 in jeans because my size 16 jeans are really starting to get loose on me. I was SHOCKED that they fit!!!!!! Now I wear a L/XL shirt and a size 14 jean! It is amazing what 7 and a half months of loosing 93 pounds can do! I do still have 39 pounds to go. If I can loose 93 pounds in 7.5 months. Hopefully, I can loose the 39 pounds by the end of the year. 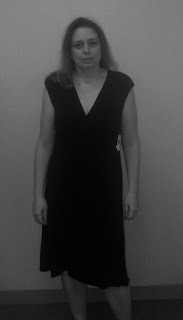 I want to wear a dress to my son's 8th grade promotion ceremony in May. So I thought I would try on a dress...and I actually fit comfortably into a size large! I so badly wanted to get it but I hope to drop a few more pounds before the end of May. My daughter and I had a excellent time out today. We went to Kohl's, J.C. Penney's and Old Navy. Kohl's had lots of things I was interested in and may go back sometime this week to pick a few things up. J.C. Penney's had some good deals on Sweaters. So I might go and pick myself up a couple of Sweaters. You look great! Wow 93 lbs that's great! I bet you can lose those few pounds for your son's promotion. ;) Keep up the great work. Happy WW!